Steven Spielberg's THE POST tells the story of the Washington Post's publication of the Pentagon Papers, after the New York Times had been prevented from continuing by a court case launched by the Nixon White House. Accordingly, the first theme of the film is one of the freedom of the press, and the importance of the press in preaching truth to power. In this case, that means exposing successive administrations interference in Vietnamese politics, the secret wars in Laos and Cambodia, and the prosecution of the war long after it was judged to be winnable, thus sacrificing many lives. However, there's clearly a desire on the part of the film-makers to make an analogy to the current administration's derision of the mainstream media. The script gives the source of the leak - Daniel Ellsberg - a line where he likens a President who rejects criticism of himself as treason, to a man who thinks he IS the State. The second theme of the film derives from its focus on the role of Kay Graham (Meryl Streep), the Post's proprietor, whose decision to publish risked time in prison and the future of her company's IPO. In doing so, it paints a picture of a woman who was born to be a socialite, still is a socialite, and only went into business when her husband committed suicide - a woman who had to learn how to operate on the job, under pressure, and a time when business women were a rarity. This focus is of course incredibly timely given the current heightened climate around gender equality. And it stands it sharp contrast with that other famous Washington Post film, ALL THE PRESIDENT'S MEN. The contrast is stark - both films cover moments in which Kay Graham had to made a decision about publishing politically and legally contentious stories. In the one made in the 70s, notable that Kay Graham barely figured, and it was the paper's editor Ben Bradlee who was the hero - in the film made in 2017 - she was the central focus. So how does Spielberg's film stack up? On the one hand, there's lots to like. It's well cast and the cast all give decent performances - not Oscar winning mind you. I liked the film's design - all muted browns and light blues, soft focus lighting, and that indescribably warm-toned 1970s feeling. I also liked the way in which the camera really moved - unusual for a Spielberg film - weaving its way - sometimes handheld- through the authentically recreated newsroom and the houses of Kay Graham and Ben Bradlee (Tom Hanks). This gave the feel a really dynamic quality and reminded me a lot of how Joe Wright used his camera in DARKEST HOUR although without quite the attention-drawing formality. I also really loved the use of architectural framing in the film to make an emotional point. What I mean by that is that - as in ALL THE PRESIDENT'S MEN and early seasons of MAD MEN - we often have the camera placed to show the ceiling of the newsroom and to give a sense of the claustrophobic camaraderie of the us-against-them newsroom. We also get a lot of scenes where the camera shows a split shot of Kay Graham in between her house's social areas and her home office - as if to show her caught between the social and business world. This is also a conflict that comes up in a lot of her exchanges with Ben Bradlee. And a lot of times we see the camera loom up on Graham and show her cowering beneath it - just as Spielberg often shows her crowded out by a sea powerful businessmen telling her what to do. But my pleasures in the film were offset by the clumsiness of a script that felt more tell than show. We get endless dialogue telling us how to interpret the action - a patronising use of (ironically) largely female minor characters. So instead of us just watching Graham and coming to the conclusion that she's brave all on our own, we have to listen to Bradlee's wife (Sarah Paulson) explaining to us just how brave Graham is. This sort of Basil Exposition nonsense happens so often it becomes wearying. I also found a scene on the steps of the Supreme Court, where Graham eschews a press conference to merely walk away, but nota bene!, through a crowd of female supporters, who's lives, we are meant to intuit, she has now changed. The result is an earnest and well-made film that simply does not trust its audience enough to allow them to reach the politically correct conclusions it wants us to reach. So we get hit over the head by a book while John Williams' score plays our emotions. By the end, I longed for the austerity of the ending of ALL THE PRESIDENT'S MEN - with a newswire banging out the end of the Nixon regime. Depersonalised. Stark. Adult. 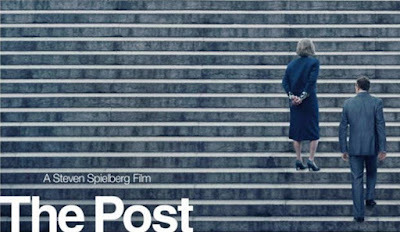 THE POST has a running time of 116 minutes and is rated 12A for strong language and brief battle violence. It was released last year in the USA and earlier this year in Australia, Cyprus, Greece, Israel, Bulgaria, Canada, India and Turkey. It is released this weekend in Singapore, Slovakia, Spain, the UK and Ireland. It will be released on January 25th in France, Portugal, Estonia, Lithuania and Sweden. It opens on February 1st in Argentina, Brazil, Hong Kong, Italy, Netherlands, Finland and Mexico; on February 16th in Norway and Poland; on February 22nd in Philippines, Czech Republic, Germany, Hungary and Russia; on March 9th in Taiwan; on March 30th in Japan; and on April 5th in Denmark.